We made a short sampler track from four tracks on the new album, and a video too. Gravity’s Dirty Work has had a positive review on the Prog Rock Stuff blog. “This is an excellent album. A bit different, but well worth investigating.” Read the full article here. The new album Gravity's Dirty Work has had its first mention in the press, on the irregularcrates blog. They described it as “a truly strong album experience that will have you mesmerised”. Read the full article here. A free introduction to the band, Selsey Reflections features the single Ahead Finitely taken from the new album Gravity's Dirty Work, together with exclusive and archive tracks: the odd time signature sequences of Selsey Reflections; the intense live performance of Light Sleeper; and the first track recorded by the project that became Darkroom, the 18-minute dub collage Alien Grace, restored and remastered for 2013. 'Gravity's Dirty Work' can be pre-ordered on Bandcamp. The new Darkroom album Gravity’s Dirty Work will be released on 1st October 2013. Download: all the usual sources (iTunes etc.) or darkroomtheband.bandcamp.com, which will provide the best possible quality downloads (generated from the 24 bit masters). Pre-orders from 5th September via www.burningshed.com/store/darkroom or darkroomtheband.bandcamp.com. 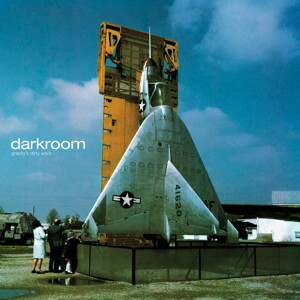 Carl at Aleph Studio has excelled himself again with the artwork for the new Darkroom album. More release details soon! Darkroom are pleased to be part of Hack The Barbican. Os will be doing a solo slot at the Music Hackspace Performances@HacktheBarbican in association with the London Music Hackspace. Our set from the London Live-looping Festival, 14th July 2013, at the Strongroom Bar, London. Very nice review of this by Georgina Brett here. Darkroom will be playing at the London Live-looping Festival 2013, alongside Rick Walker, Matt Stevens, The Lucid Brain Integrative Project, Iris Garrelfs, David Cooper Orton and Georgina Brett. Event page on Facebook is here, or for the non-Facebookers here. After what turned out to be almost exactly three years, our podcast is back in action. Two videos from late last year, both at the Troyganic Cafe, London, at events organised by the Music Hackspace.